Mozilla contributors participate from all over the globe. We participate in ones and twos from home. In Internet cafes and hacker spaces and university buildings. In Mozilla spaces with large concentrations of peers. In every continent, including Antarctica. Our participation structure is distributed, decentralized and highly individualized. In this way we represent the Web. We’re also human beings, of course, and we *love* to get together. It’s fun, it allows us to get to know each other, and to exchange the high-bandwidth ideas that face-to-face provides. And it helps us develop a shared understanding of what we are doing. This year we’re going to gather as many key contributors as we can at the same time for the 2013 Mozilla Summit. The Summit will be open to about 1,000 Mozilla volunteers and all 900 or so of our employees. This will be the first time since 2010 that key volunteers and all Mozilla employees will have the opportunity to gather together and to work face to face. We expect this to be very exciting. Our last Summit was in 2010 and gathered about 600 people. It seemed huge then, yet in 2013 we’ll have more than three times as many people. Because of this we’re going to try some new things. First, we’re going to try having three different locations rather than gathering 2,000 people in one place. This means the Summit will be different than 2010. Exactly! Mozilla’s not like 2010, the world isn’t like 2010, and innovation is at the heart of who we are. So we’re going to try some innovations. We’re hoping to have three locations, each with the intimacy (!!!) of 600 or 700 people, some shared content and some innovative ways to join the three locales. We’ll learn from this and use what we learn to design our future events. The multiple locations means that the Summit will be different than a geo-located “work week.” It’s unlikely that everyone who you’ll want to see face to face will all be in the same place. On the other hand, an organization our size needs trusted connections across groups, and good relationships between people you would never have thought to get to know. My greatest hope for the Summit is to develop a shared understanding of who we are as Mozilla, how we plan to move our shared mission forward, and how our products and offerings fit into these goals. That of course means getting to know people, lots of spontaneity and fun settings and of course some real quality time exploring our products and programs. To do this, we’re planning to identify a pretty good size planning group. That group will do a bunch of pre-work, and will meet in mid-June to figure out the content for the Summit and help shape the overall experience. The Summit should be great fun. It is a hugely important step in bringing Mozilla together and developing a shared understanding of who we are and how we and our products bring openness and freedoms to digital citizens. Civil society is not just politics: it is a restaurant giving unused food to the poor. It is a for-profit company such as Twitter providing its service free to rich and poor alike (even though advertisers will focus on the rich). It is successful entrepreneurs mentoring start-up entrepreneurs, and NGOs engaging not just with the government, but also with commercial outfits to get support for activities that will address vexing social problems such as maternal and infant mortality. I was reminded of Esther’s focus on civil society at the CrisisCamp event Friday night. There’s no official government involvement. There’s not necessarily any direct connection between the people working at this and the villages or individuals affected by the floor. There is however civil society in action: see a problem, do something. Form an association (Ben Franklin formed a surprising number of associations), virtual or formal. Build a tool — or a product. Reach out. Don’t wait for government to set up a special official organization — plunge in and do things. The degree to which citizens believe they can, can, and do affect their own lives and the lives of others is a pretty potent marker of the nature of a society. The Mozilla community in Poland is one of the earliest and strongest Mozilla communities. MozillaPL has been active for a decade — well before Firefox, before the Mozilla Foundation was established and before we shipped our first product (the Mozilla Application Suite) in 2001. In the dark, difficult days of Mozilla before we were a “success” the MozillaPL team was a clear indicator to me that we were on the right track. In those days — before RSS, before social networking, before personal blogs — our only project wide news source was an independently run fanzine called “Mozillazine.” The first time I saw an item about MozillaPL I was astonished. And the items kept coming. Mozilla PL did this, MozillaPL provides support, MozillaPL had this great idea and is making it happen. The creativity, dedication and leadership of MozillaPL made it clear to a bunch of Mozilla contributors that the difficult days of Mozilla could lead to something better, something much brighter. plus a hero of the Solidarity movement, and dozens of other people heading to a memorial of national significance itself. 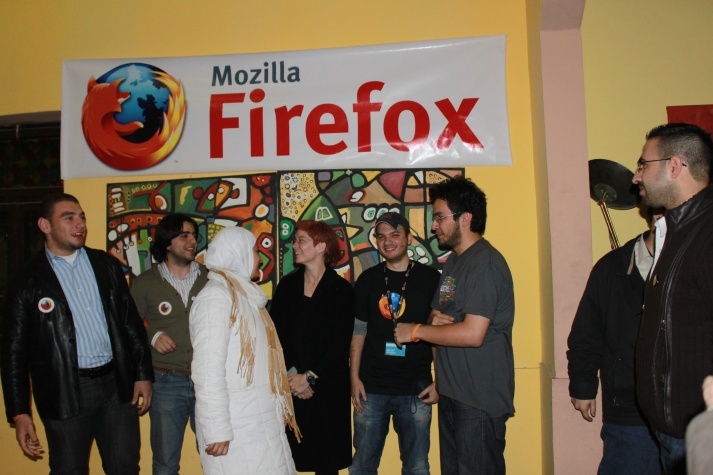 I was lucky enough to be in Amman near enough to the 5 year anniversary of Firefox to join in the 5 year celebration. 20 or 25 people got together in a art-house environment (old building for Amman, refurbished as art studio / hangout / gathering place) to celebrate. The organizers talked a bit about the activities of the Mozilla Club and the Open Source Association at the Jordan University of Science and Technology. Then we had a discussion about Mozilla. I gave a brief intro for those who weren’t so familiar with Mozilla, or who are familiar with the products we build but not why we build them. Then we had lots of questions. The questions were fun and sophisticated and wide-ranging. Many thanks to everyone involved. I was honored and had great fun as well. Last week I visited parts of the Middle East for the first time. I hope to get a summary and some photos up soon. For now I want to thank a few people of the amazing people who went far, far out of their way to host Mozilla and me. First, Donatella Della Ratta of Creative Commons, who did an amazing amount of work to arrange a series of Creative Comments events in Amman, Damascus and Beirut and invited me along. I attended only a few of these at the beginning of the Creative Commons tour, but it was enough to see how much was involved and how much Dona pulled together stunningly diverse set of activities. Unfortunately, my involvement caused Dona to miss a pivotal event while she sat with me at a long (6 and 1/2 hour) wait at a border crossing, something I regret deeply. Bassel Safadi, who showed immense hospitality, patience and flexibility. Bassel is the kind of person who makes it seems as if a large group of people are working on something, when in reality a lot of the work is just one person. And with an attitude that’s hard to match. My prolonged border crossing threw a wrench into Bassel’s day as well but he managed with grace and engineered a series of great gatherings. Samer, who spent close to 7 hours with me at the border and remained gracious and professional and positive throughout. Eman, Issa, Rami and Ashraf of the Mozilla Club and Jordan Open Source Association, who arranged a Mozilla event in Amman, where I met a set of people interested in Mozilla, and to those — you know who you are — who stayed and spent a portion of their evening talking about software, open source, and life in general with me. Everyone at the Queen Rania Center for Entrepreneurship and the Young Entrepreneurs’ Association in Amman, especially Mohammed Khawaja, Mohammed Kilani, Aya, Basel, Evelyn, Ayman Azzeh, Catherine and Habib, all of whom went out of their way to make a great trip. They organized a week’s full of activities for the celebration of Entrepreneurs’ Week in Jordan, including several that I participated in. And Samer for helping me get to the airport, and offering to pick me up from the border if I got turned back. This turned out to be unnecessary but it was very reassuring to know the offer was real if I needed it. Starting today, July 6: 11 a.m. Pacific time is the new time for the weekly Monday project-wide status meeting. We’re moving the meeting two hours earlier in the day to make it easier for European contributors in particular to participate. It still isn’t perfect, especially in Asia, but we haven’t magically found a time that works in all time zones. This is the first change to the time of this meeting we’ve made in at least a decade. We’ve been meeting at 1 p.m. Pacific time since mozilla.org was tiny, many of us were employed by Netscape and long before we had even started developing the products we know today as Firefox and Thunderbird. In fact, we set this time when SeaMonkey (officially released in June 2002 as the “Mozilla Application Suite 1.0” or “Mozilla 1.0”) was still years in the future. I will be heading back to Brazil very shortly. From April 14 to 16 I will be in Rio de Janeiro to participate in the World Economic Forum on Latin America, and after that I will head to São Paulo to connect with our Latin American community. On April 17 I’ll be visiting a LAN house with Bruno Magrani, who works with our Portuguese-speaking community, as well as Guillermo Movia, who works with our Spanish-speaking community members. April 18 will be devoted to a day-long meeting with Mozilla’s Latin American community leaders on the general direction of the Mozilla Project in Latin America, the individual projects people have been working on, and probably some strategizing for FISL. I’m looking forward to these discussions immensely and to catching up again with some of the folks I met last year. I’m also very interested to meet new contributors to Mozilla and those interested in creating an open, participatory web whether or not Mozilla has been your focus. If you are interested in attending this meeting in São Paolo, please contact Bruno (bmagrani at mozilla dot com) or Alix Franquet (alix at mozilla dot com). Late in July we got together close to 400 extremely active Mozilla contributors for a face to face gathering known as the Firefox Plus Summit. This gathering was partly acknowledgment and celebration of our work so far, and mostly preparation for the future. The Summit has caused me to reflect on the future of Mozilla. In short, that future is bright. The overriding reason for this is the strength and vibrancy of the Mozilla community. We’re growing, we’re effective and we’re expanding the types of activities that live within Mozilla. The Summit made this very clear. There are other reasons as well. Mozilla combines the abstract goals of Internet openness, participation and decentralized decision-making with the concrete task of building great products. This combination is working. It attracts people to Mozilla, and it gives us a way of building products that reflects the Internet itself. The values of the project bring meaning and guide the way we do things. The software allows us to make those values tangible, and put their manifestations in the hands of millions of people. Another important element is the financial resources Mozilla enjoys. We’ve just renewed our agreement with Google for an additional three years. This agreement now ends in November of 2011 rather than November of 2008, so we have stability in income. We’re also learning more all the time about how to use Mozilla’s financial resources to help contributors through infrastructure, new programs, and new types of support from employees. We have large challenges ahead of us, there’s no question of that. There are many ways in which Internet life could become closed, manipulated and decidedly unpleasant. And Mozilla itself is not perfect. Many improvements are possible in how we work and what we accomplish. To be effective we’ll need to do our best, and then do even better. Our challenges are real, our opportunities are real, and our strength is real. Put those together, and the future is bright. One of the great things about Mozilla is that periodically I’ll be thinking about how to get something done and then I’ll look up and find someone else has already done it, and often gone further with the idea than I would have. Dave Eaves’ post today about “The challenge of Mozilla’s magnetism” is an example. I’ve been thinking about this all weekend, writing a post in my head. But now I don’t need to, Dave’s got just about everything I was thinking about already pulled into something coherent. The first three-quarters of the post are almost exactly what I was thinking — particularly the reasons for the pull of Mozilla to so many people and the need to balance that with what strengthens our current communities. Personally, it’s much better to hear this from Dave than to see it written by me. That’s because once it’s clear that a set of people wanting Mozilla to do more also understand the precious nature of our current communities and how strengthening them must be central, then it’s much easier to be open and responsive to ideas for expanding. The last paragraph — a suggestion about the minimum plan Mozilla should build and execute to work with others who care about the open Internet — is really helpful. It seems so obvious when written this way — of course Mozilla should do this. We may in fact be able to do more, but we don’t need to wait to figure out how much more to get started. In a post last week I talked about concentric circles of community, noting that I actually think of Mozilla as concentric spheres of community. That’s because each community (practice, action, interest, user) is made up of many different sub-groups. For example, the Community of Practice is that set of people who are sharing resources and using a bunch of Mozilla practices together to achieve a result. Within this group we can find many different kinds of activities. We might think of subsets based on the project, such as the Firefox, SeaMonkey, Thunderbird, Camino, Bugzilla, or Calendar communities of practice. We might think of subsets based on activity — the localization, quality assurance, coding, website, design, UI, support, infrastructure communities or practice. We might think of subsets based on language or locale. There are so many dimensions to Mozilla communities that I think we need (at least!) three dimensions to have a working model. To help with this, there is now a wiki page for discussion of the Mozilla community to see if something other than blog comments is better for a long term discussion.